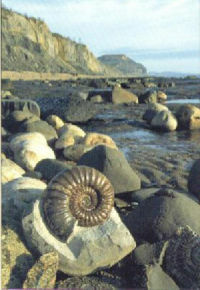 "The shells, oysters and other similar animals which originate in sea-mud, bear witness to the changes of the earth…Great rivers always run turbid…and this wearing disturbs the face of the strata made by the layers of shells, which lie on the surface of the marine mud, and which were produced there when the salt waters covered them; and these strata were covered over again from time to time with mud of various thickness, or carried down to the sea by the rivers and floods…and thus these shells remained walled in and dead…At the present time these bottoms are so high that they form hills or high mountains…"
Have you ever wondered why shells appear in places high above sea level? During the Renaissance, people believed that they had been deposited high up on mountains during the great flood or “Deluge” described in the Old Testament. They did not know about mountain building and the geological processes that can raise fossil-bearing, sedimentary rock strata to great heights. Never content to blindly accept the traditional view, Leonardo set about investigating the underlying causes of such natural “effects” for himself. Around 1481, he wrote of “two layers of shells” which he had seen high in the hills outside Milan. His interest in fossils seems to have been well known by some people. He recounts that when working in Milan on “the great horse” (the Sforza Monument) some peasants brought him a sack of sea shells and corals. Presumably they had hoped to obtain a handsome reward! Leonardo noticed that the implications of the Biblical Deluge were not born out by the observed facts. If the Deluge had been the cause, there should be records of sea creatures at the top of mountains, as the entire surface of the earth was supposed to have been covered by its waters. Therefore the Deluge would not have caused the layered distribution of shells in strata at particular levels. Also, successive strata indicated “more than one inundation” – there had to have been more than one flood. Sea creatures should have been stranded in high lakes when the Deluge retreated, and it could not be argued that the fossils were dead animals washed there by the Deluge, because the strata contain evidence that the creatures were alive. Leonardo felt pretty confident about his deductions, adding that those who expressed contrary opinions showed “silliness and stupidity” as did that “other sect of ignoramuses who believed that nature or the heavens had created them by celestial influences”! To Leonardo’s mind, geographical flux must lie at the heart of the matter. But what caused the movement of waters in and around the body of the earth? In order to understand the mechanisms by which the “terrestrial machine” operated, Leonardo evolved a theory of the earth’s formation that was truly breath-taking in the scale of its vision. He proposed that the earth was contained within a “watery sphere”, which he illustrated as a triangle in a circle with its angles protruding from the circumference. He described the principle as a pyramid embedded within a sphere of water. The projecting elements represented landmasses and mountains. In order to illustrate why the earth remained spherical, he provided instructions to submerge a cube of led “the size of a grain of millet attached to a string in a drop of water”. The drop will not lose any of its original roundness, although it has been “increased by an equal amount to the size of the cube shut within it”. But things were not that simple. The shape of the earth was irregular and its density was not uniform. 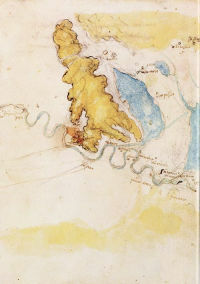 In his drawings in the Codex Leicester, Leonardo illustrated his concept of the mingling of earth and water as a marbled mass, containing huge caverns and subterranean lakes. Cross-sectional diagrams show how layers of earth and water continually fold in upon themselves, pulled toward the centre by gravity and pushed toward the periphery by the lightning of their mass to form new landmasses and mountains on the earth’s surface. In tandem with the microcosm macrocosm analogy, by which the body of man was seen to embody the same fundamental laws of nature that governed the “body of earth”, Leonardo visualized the world as criss-crossed by a circulatory systems of channels. “Veins arise from the bed of the seas and intersect the world and ascend to the mountains and travel back again to the rivers and return to the sea”. But the belief in the universality of natural law was a double-edged sword for Leonardo. His study of human anatomy eventually led him to doubt the validity of his early claim for the earth’s circulatory system. 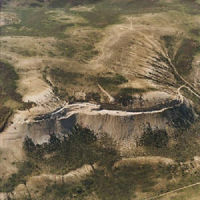 Whereas the veins of a man were seen to “silt up” and narrow in old age, the reverse seemed to happen in nature, where “the concavities of the hollows of the veins of the earth are enlarged by the prolonged and continuous passage of water”. He also realized that “the origin of the sea is contrary to the origin of blood, because the sea receives into itself all the rivers which are only caused by the water vapours rising in the air”, while the sea of blood “rises in the veins”. How did water reach high places to form mountain springs? 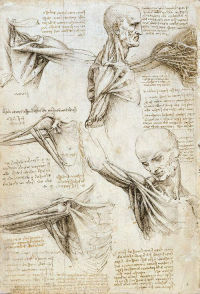 A satisfactory understanding of the source of the formative powers of nature continued to elude Leonardo. He designed experiments involving siphons, but they did not supply the proof required. He applied an analogy with the blood of animals “which is always transported from the sea of the heart to the summit of their heads, and when one ruptures a vein, as when a vein is ruptured in the nose, it will be seen that all the blood from below is raised to the height of the ruptured vein”. In an analogy with plants, he considered how sap oozed from the top of a severed vine. But nothing seemed to provide the solution he so desperately sought. You can almost sense his awareness of his own limitations when he proposes that “the oceanic sea cannot penetrate from the bases to the summits of mountains…but only ascends as far as the dryness of the mountains attracts it”. Ultimately, the analogy of the earth as a living body comparable to the body of man was deprived of its life-blood. In the end, Leonardo seems to have reconciled himself to the fact that the mysteries of the earth and creation lay beyond human understanding. The forces of nature were incomprehensible and uncontrollable. At the end of his life, in a series of studies known as the Deluge drawings, and in written descriptions of devastating storms, Leonardo gave visual and verbal expression to his belief in the overwhelming and ultimately destructive power of nature. And the rivers thus pent up were flooding out and submerging a great many lands and their inhabitants. Again, you might have seen many diverse kinds of animals huddled together on the summits of many mountains, terrified and broken, at last, like domestic beasts, in company with the men and women who had fled there with their children.